Or the People Who Bought It? "I am a quilt maker and “quilt genealogist” and I am currently working on an embroidered signature quilt in an old studio portrait with the title: “Soldiers and Sailors of Genoa Twp., Delaware Co., Ohio, USA. R.R.S. 1919” The quilt contains the names of 58 local soldiers and sailors who served in WWI along with their company &/or service location, plus 13 school children and one teacher. My goal in researching any signature quilt is to try to give these quilts back their voice, bringing them out of anonymity and eventually return them to the areas where they originated along with my documentation about them. 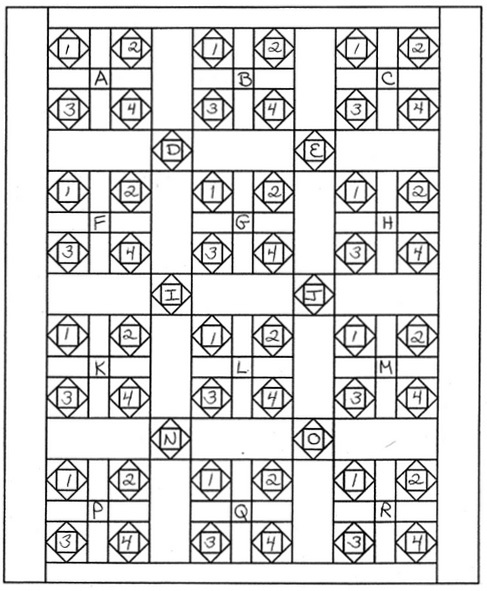 I am very pleased with the information that I’ve found so far about the Genoa Township quilt, but there are still unanswered questions. On Ancestry.com I was able to locate lots information about almost all the men and children with the help of the 1910 & 1920 census records, plus Ohio military records and obituaries. I traveled to Columbus two weeks ago on other business and was able to do some additional on-site research which was also very successful. I found 3 very helpful articles at the Westerville & Delaware Public Libraries, two from the Westerville Public Opinion and one from the Delaware Journal Herald. 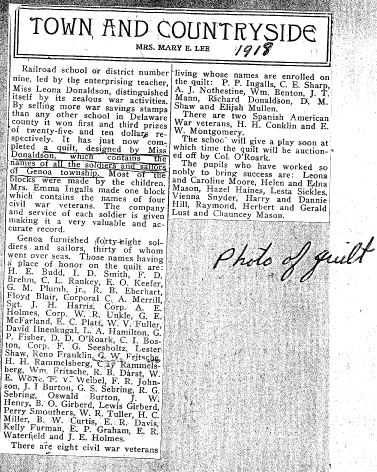 I tried the Sunbury News but learned, sadly, that the year 1919 is missing. With the help of these articles I now know that “teacher” Leona Donaldson and her 13 students at Rail Road School #9 made the quilt. I know that it was to be auctioned off on May 21, 1919 at the school at 8pm. Proceeds would be given to the Red Cross. I was not able to find out the “rest of the story” - who was the high bidder and how much did it raise for the Red Cross." Carolyn bought the photo of the quilt at an antique auction around 1994. She did some research on the photograph then put it away. Now she wants to know all about it - including where the quilt is today. 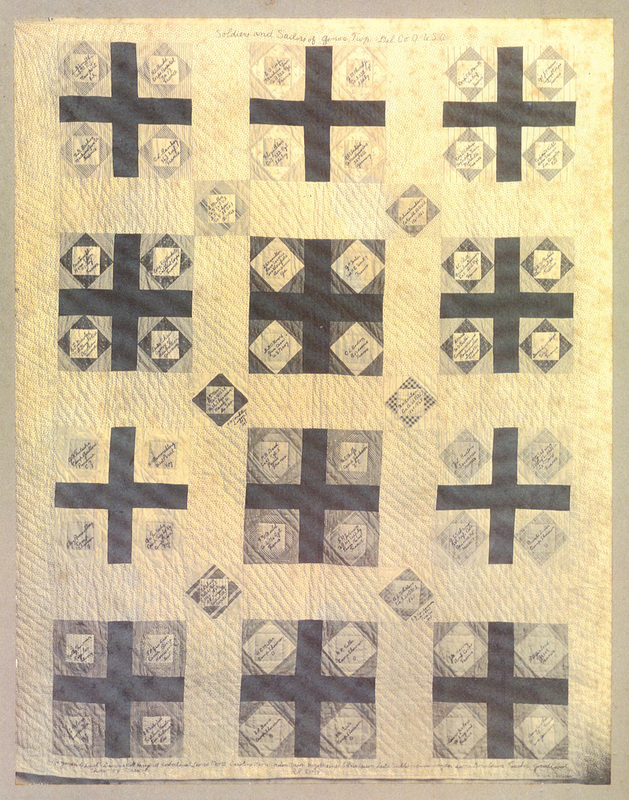 The quilt designed and made by the teacher and pupils of the Railroad school containing the names of the fifty-eight soldiers and sailors of Genoa Township, Delaware, Country with a record of their service will be auctioned off at the school by Col. V. J. O’Roark, May 21 at 8 p.m., the proceeds to be given to the Red Cross. The same evening the pupils will give a patriotic comedy under the direction of the teacher, Miss Leona Donaldson. The quilt is all hand-made of beautiful design, of good material and the best of workmanship. It will be shown in Westerville at the Glen Lee Place May 17 and 18. A beautiful "service quilt" containing the names of the 58 men from Genoa township, this county, who participated in the great war, will be auctioned off at the Railroad school in that township on the evening of May 21. Proceeds will go to the Red Cross. Floyd Blair is in Bottom Right Corner of Block B at the Top of the Quilt in the Middle Patch. daughter. Leona is the teacher who designed quilt. She and her students made it as a service project. 3. William & Geroge Fritsche are brothers. 5. Ben & Lewis Girberd are brothers. 6. Alfred & James Holmes are brothers. 7. Fred Johnston and Wayne Wolfe are step brothers. fathers, August & William are brothers. 9. George & Roy Sebring are brothers. 10. Daniel N. & Lester Shaw are great uncle and nephew. 11. Dannie & Harry Hill are brothers. 12. The Lust boys are brothers. 13. The Mason children are siblings. 14. Caroline & Leona Moore are sisters. 1. Kiefer, Earl O. living at home with his family. 2. Plumb, Grant M. Jr. living at home with his family. 17. Dowler, Edgar Fenton living with his family. 20. Miller, Harry L. living with his family. 21. Shaw, Daniel N. living with his wife Lovina. Age 71, born 1849. 30. Johnston, Fred R. living with his family. Wolfe, Wayne E. is a step son living with the Johnston family. 33. Darst, George & Belle, Rollie Perfect’s parents. Rollie is living in Akron Ward 5, Summit, Ohio with his wife Mary. 34. Moore, Fred & Eva. Fred is Caroline & Leona’s paternal uncle. 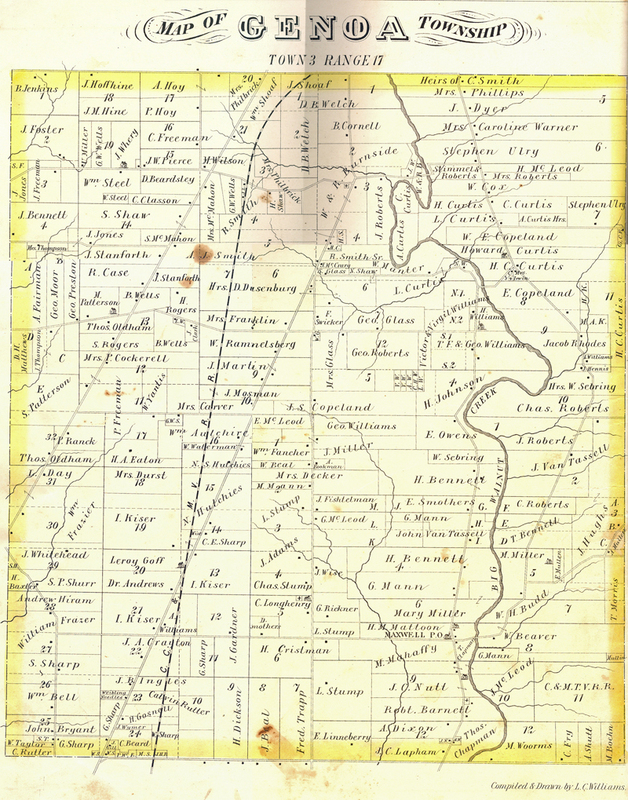 In 1910 families lived in this county and township. Caroline & Leona are now living in Franklin Co.
56. McFarland, Guy E. living with his family. 65. Conklin, Howard H. and wife Fannie and 3 children. 69. Nothstine, Abraham J. and his wife Sarah, with their grown children, in-laws and grandchildren. 72. Sharp, Clinton E. living with a house keeper, Samantha A. Weyant? & Florence, in 1900. In 1920 Donald Dean is still in Brest, France, aboard the USS Chandler. 75. Unkle, Wm. R. is living with his family. 79. Harris, John H. is living with his family. 81. Merrill, Byron & Grace; Charlie A.’s parents. 86. Ingalls, Emma C., a 64 year old widow. Pearl’s wife, living alone. There’s a death certificate for a Pearl Ingles, Delaware Cty. 88. Donaldson, Richard and his daughter Leona (the teacher). 90. Fisher, George P. living with his family. 94 Sickles, Lesta L. living with the Howald family as a servant. 18 years old. 103. Mason, Edna, Helen, Chauncy. Living at home with family. 108. Haines, Hazel, at home with her family. 112. Fritsche, William and George W., living with their father, Ernest. 113. Rammelsberg, Harry H. living with his family. Harry is Clay’s cousin. 116. Lust, Herbert, Gerald & Raymond living at home with their family. 117. Fuller, Wayne V. living at home with his parents. 118. Shaw, Lester living at home with his parents Lell A. & Charlotte. 134. Curtiss, Benjamin Wilbur living with his sister Leta. 139. Platt, Charles and Leora or Leona, are Edward C.’s parents. Edward & his wife Mona are living in Galena, Delaware Cty. 140. Mann, Joseph T. living alone. Age 76, still a farmer. 162. Brehm, Frank Delno, living at home with his family. 171. Benton, William living with his wife, Ida, and grandson George. 173. Smith, Lovett D., living with parents, Peter J. & Gusta. 176. Farman, Fred P. and Aelpha (Zelpha) with their children. Kelly D’s parents. Since Kelly deserted the army in 1918, I’m not sure where he might be. 210. Sebring, Roy G. living with his parents and maternal grandmother. 212. Sofia Laken, the farm where David Linenkugel is working in 1917.